Official preview images for the Arrow episode "Fundamentals"
So far there are only four pictures; hopefully more are coming at a later time. Here’s how they describe it; photos from this Stephen Amell-heavy episode can be found underneath the description. OLIVER IS VISITED BY A GHOST FROM HIS PAST – In his darkest place yet, Oliver (Stephen Amell) wonders if he has failed at everything – being a father, a mayor and a hero. His frustration rising, Oliver lashes out at Felicity (Emily Bett Rickards) and William (guest star Jack Moore). A surprising visit from an old friend has Oliver questioning his next move. Ben Bray directed the episode written by Speed Weed & Emilio Ortega Aldrich (#618). Original airdate 4/12/2018. 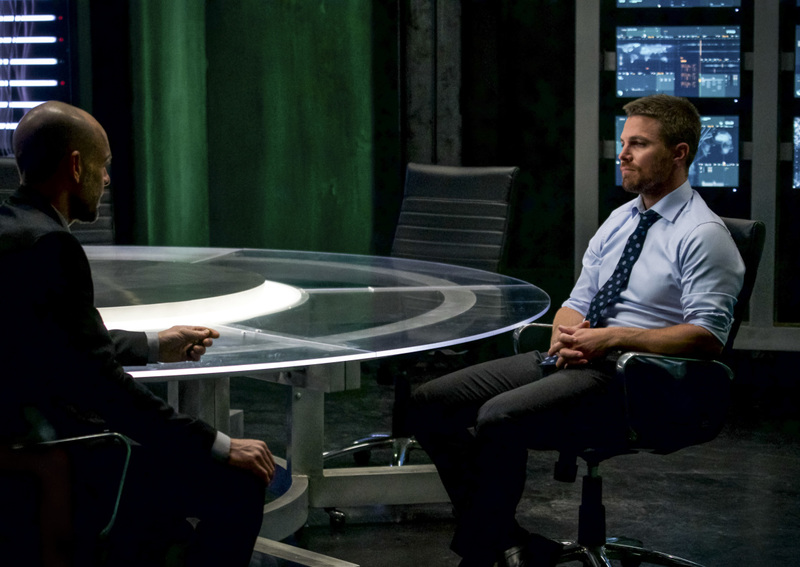 Arrow -- "Fundamentals" -- Image Number: ARR618a_0028.jpg -- Pictured (L-R): Paul Blackthorne as Quentin Lance and Stephen Amell as Oliver Queen/Green Arrow -- Photo: Shane Harvey/The CW -- ÃÂ© 2018 The CW Network, LLC. All Rights Reserved.